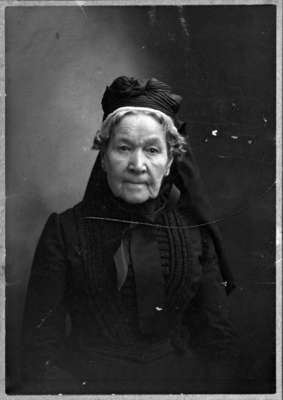 A black and white portrait photograph of Mrs. Robert John Gunn (Agnes Pringle) (1821-1911). Mrs. Robert John Gunn (Agnes Pringle) was born at Edinburgh, Scotland in 1821 and came to Canada with her father, John Pringle in 1833. The family lived at Cobourg until moving to Whitby in 1836. On October 24, 1849, Agnes Pringle married Dr. Robert John Gunn, a pioneer physician in Whitby, who died in 1902. Mrs. Gunn died at Whitby on September 13, 1911 and is buried at Union Cemetery, Oshawa.